Editor's Note: Big changes in the law favor the carriage drivers! The ASPCA was a designee of the Department of Health; the NYPD is not. What difference does it make? A world of difference to the horses, and it's terrible news. See Postscript 2 below. We have a problem in New York City. Street laws governing the carriage trade are mostly not enforced. This includes the horses being forced to work illegally during adverse weather conditions - i.e. snow, icy conditions and heavy rain. 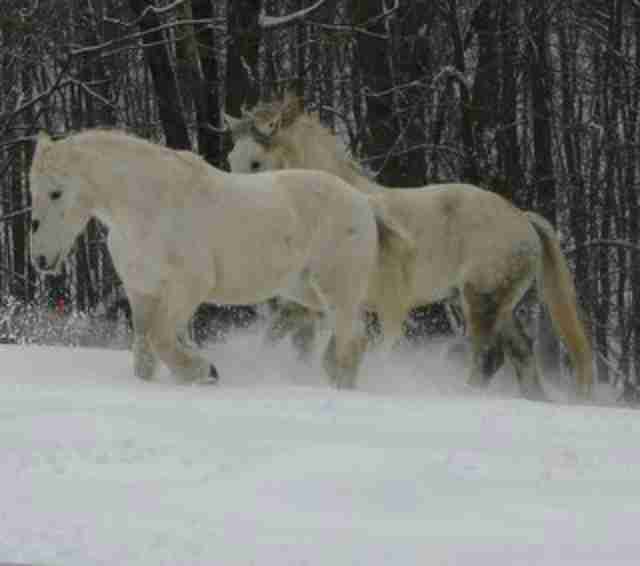 Most horses love to play in the snow. They're like kids. They will kick up their heels; trudge and run around in it and roll. Rolling is, of course, palpable horse joy. Horses do much better in the cold weather than hot. The ones who spend more time outdoors even grow winter coats. The horses below are Monty, Rocco and Teddy from Central New England Equine Rescue. Monty and Teddy are former rescued Boston carriage horses. What horses do not like, however, is being out in the snow and ice, tied to a horse carriage, with no freedom of movement, pulling ignorant tourists and greedy drivers; or made to stand in the same icy, slushy spot waiting for passengers. This is not work. It's frivolous entertainment and it's cruelty. But more importantly, it is illegal in New York City for drivers to work their horses in adverse weather conditions, which include snow and ice - regardless of the temperature. This can be found in the Administrative Code and Health Department regulations. New York City Administrative Code - § 17–330 Regulations. f. Owners shall not allow a horse to be worked on a public highway, path or street during adverse weather or other dangerous conditions which are a threat to the health or safety of the horse. A horse being worked when such conditions develop shall be immediately returned to the stable by the most direct route. The City Charter, Department of Health and Mental Hygiene Rules & Regulations goes further in its description. § 4-05. Working Conditions. Adverse weather conditions shall include but not be restricted to snow, ice, heavy rain or other slippery conditions. In January 2014, the American Society for the Prevention of Cruelty to Animals (ASPCA) officially gave up humane law enforcement with the New York Police Department (NYPD) assuming the responsibility. The ASPCA was often criticized for doing a less than stellar job, but even though they did it on a volunteer basis, they still accepted that responsibility. Not so the police. Here it is more than one year later and the street laws are still not being enforced. By street laws, I mean violations that can be observed outside - on the street. They include drivers making illegal U-turns; running red lights; using hand held mobile phones while driving; leaving their horses unattended and untethered; overloading their carriages - all laws whose genesis is in public safety, laws that are intended to protect everyone - horses, pedestrians, carriage drivers and their customers. Why is it so difficult to get the NYPD to enforce these laws? If they do not want to do so, then let them admit it and let's shut down the industry for noncompliance. Or is our government OK with allowing the drivers to break the law and essentially do what they want - contributing to the wild, wild west laissez faire attitude. Or is it really just anarchy? The carriage drivers have the shameless audacity to say that the industry is overseen by five different agencies with 144 pages of regulations. This remains unchallenged because the New York media is mostly on their side and accepts these pronouncements as truths.But 144 pages of regulations means nothing if they are not being enforced. 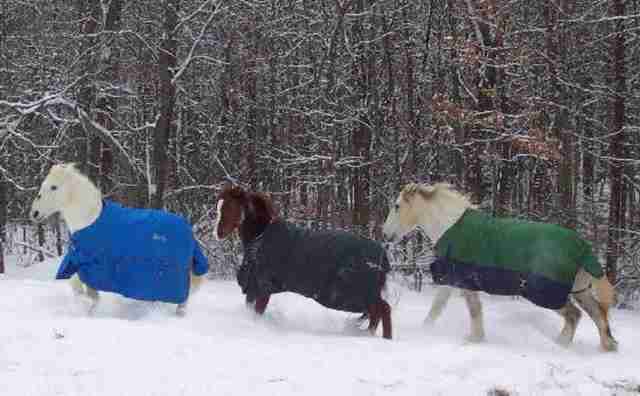 Horses working in bad snow conditions on 3/1/15. This past Sunday saw some heavy snow that started late morning in New York City. It got heavier and heavier causing dangerous driving and walking conditions. Both the Sanitation Department and New York City's Office of Emergency Management (OEM) issued a travel advisory the day before. OEM referred to it as a "wintry mix of snow and freezing rain. The National Weather Service had also issued a Winter Weather Advisory for 10:00 am Sunday through 7:00 am Monday. On Saturday, the Daily News forecast 4 to 8 inches of snow in New York. 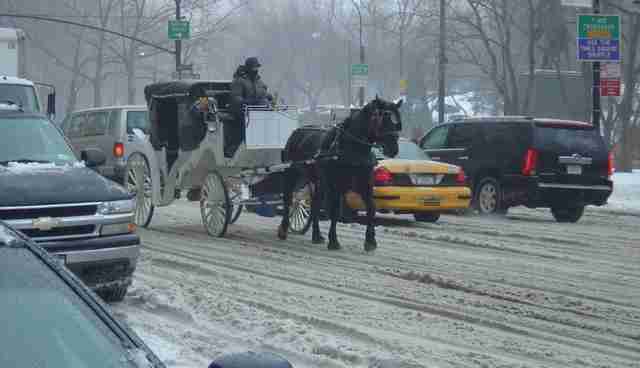 Snow storm: Although this snow storm was forecast accurately, the carriage drivers were out plying their trade and the NYPD was nowhere to be seen. Enforcement problem: Why weren't the officers out on the hack line after it began to snow, waiting for the conditions to worsen and suspend the operation? Instead, it took telephone calls from concerned citizens asking the NYPD to shut down this business. Even then, they promised different callers that they were sending a car out but ½ hour later, that car did not come. And this was from the Central Park Precinct, which is in Central Park! When the NYPD car finally came, they missed the carriages that had gone into the park with fares. So they had to be called again. I am not sure if the carriages were officially suspended on Sunday because this is "secret" information - although I hear that most carriages eventually went back to the stables. 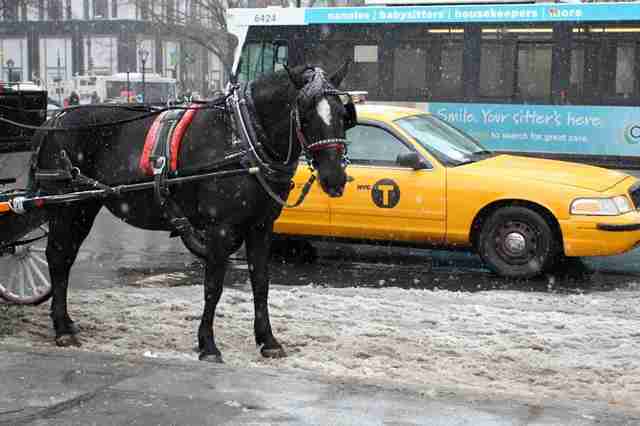 And of course, this begs the question as to why the carriage drivers would even subject their horses to this kind of harsh weather and dangerous conditions. After all, they claim to love them like their own children. What a mess. Why does it take caring and concerned citizens to make the NYPD do its job? These pictures were taken only a few years ago and show what happens in the winter during a heavy snow storm. The law is simply not enforced. The picture at the header was taken this past Sunday. Nothing has changed. If the city is able to be prepared and issue snow advisories - why were the carriage drivers even allowed to operate on Sunday? Snow falling on icy streets that were left over from previous snow storms and very cold weather created highly dangerous and treacherous conditions that can cause serious accidents. This article from the Baltimore Sun describes the dangers of horses being out in these weather conditions. So where do we go from here? There is sure to be more snow falling on New York City streets this winter. Contact us at coalition@banhdc.org if you want to see this issue resolved. Contact your council member: If you have not contacted your Council Member yet to support Intro 573, the bill to ban horse-drawn carriages in New York City, do so now.Call them. E-mails get deleted. Many are not aware of the constant disrespect for the law displayed by the carriage drivers who profess to "love their horses." Send them this article. You may find your council member by clicking here. New York is a highly populated and congested city - not a back woods village with country roads and a population of 1,000. Allowing these dangerous contraptions on the street in this kind of weather is irresponsible on the part of the City. They are supposed to protect the welfare of the populace. And they are supposed to protect these horses. Postscript: As I write this blog, it is snowing out - sleeting and icy. I called the Central Park Precinct and they told me that "Headquarters" ordered a suspension. This was about 5:30 pm. Then about 1/2 hour later, someone told me she was at the park with her dogs and the horses are still out. I called the officer back. He admitted that the police car just drives by and it is not clear even if the officer gets out of the car. I told him they have to go into the park just like the ASPCA did to track down the drivers who try to avoid them. Yes it is a mess. And it will continue to be so until all interested parties take this animal exploitation, cruelty and public safety seriously. Postscript 2: When the ASPCA did humane law enforcement, the law stated that the carriage horse regulations were enforced by the Department of Health or their designee, which was the ASPCA. 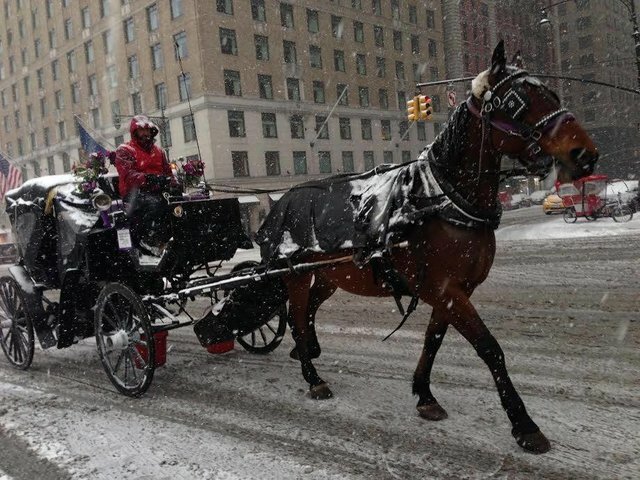 The ASPCA had the power to suspend the carriage trade ON THE SPOT due to weather conditions. The ASPCA gave up this enforcement to the NYPD in 2014. But what was never made clear to us is that the NYPD is not a "designee" of the DoH. How did this come about? Why change a system that had worked for the most part into something that was destined to fail? Who benefits? This is what appeared to have happened on Sunday during the bad snow storm, which began sometime after noon. It is the new "suspension process." The NYPD observes the carriages working in the snow. If they make the decision that the trade should be suspended due to weather conditions, they contact someone at the Department of Health to request that they make it official. But here's the rub. The DoH is closed on weekends and in the evenings. Trying to track down someone via Blackberry to make this important decision is very difficult. So difficult that it was not until 3:30 p.m. that the DoH issued the official suspension-although it began to snow heavily around 1 pm. This is just outrageous! The Mayor's office, Department of Health and the NYPD need to do a much better job for the horses and the public. As with the ASPCA, the NYPD needs to be able to have the authority to make this suspension immediately.